The popular Dasher is very accurate and has set many records. It has a bit more neck than the BRX. Gunsmith Dan Dowling is credited with its invention. 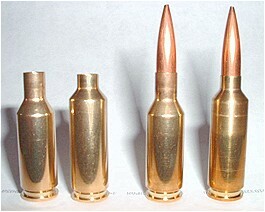 It offers about 3.5 grains (10%) more case capacity than the standard 6BR–good for an extra +130 fps with a 105gr bullet. Effective out to 1000 yds, the Dasher holds the NBRSA 6-target 1000-yard world record Agg. Pacific Tool & Gauge (Dave Kiff) is a good source for 6 Dasher reamers. Specs: 40° shoulder, blown forward .10″, Neck-length = .246″. Requires Custom Dies. The 6 BRX is the brainchild of champion F-class shooter Bob Crone. It leaves the shoulder angle unchanged so you can use regular 6mm BR dies, though a custom reamer is required to cut the chamber. While 6 Dashers seem more common, the 6 BRX offers equivalent performance with lower tooling cost. 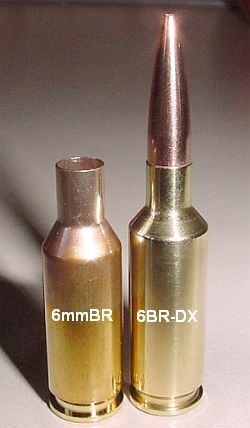 For that reason, the 6 BRX may be the smart “improved” choice if you want more velocity from your 6BR. Clymer Tools has the reamer for the 6 BRX, using Crone’s original design. Pacific Tool & Gauge also has BRX-style reamers. Specs: 30° standard shoulder, blown forward .10″, neck-length = .210″. Can use standard dies, but the case will not fit a standard chamber. While the BRX gives up a little capacity by using the standard shoulder angle of the 6mm BR Norma case, velocities will be right up there with the 6 Dasher. Here is a report we received recently from Scott Parker in California: “I have just worked up loads for my 6BRX. It is a Barnard action in a Mastin stock with a Broughton barrel at 31″. I started by trying a ladder test at 100 yds. I loaded 11 rounds covering 32.5 grains to 35.0 grains of Varget with mollied Sierra 107s. 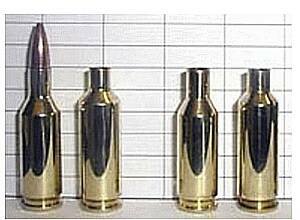 All 11 rounds went into a group .464″ tall by .397″ wide. So, I repeated the test only this time I fired 3 shot groups. I found 2 nice spots at 33.5 grains and 34.5 grains. The groups were tiny–like .16-.18″. I then shot two, 5-shot grups with both loads. Both loads produced 5-shot groups under .185”. 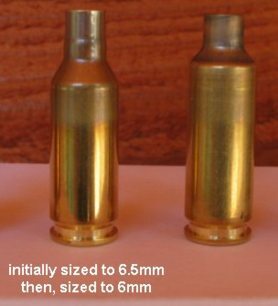 The velocity for the lighter load was 3020 fps. The higher load was 3104 fps. I took the scope off and put on my rear sight. I posted a 100yd reduced prone target. I laid down and shot 100-9x. This is the most accurate rifle I have ever owned, shot or seen. The 6BR-DX is an improved version of the 6mm BR Norma cartridge, with a 40? shoulder and a bit less body taper than a Dasher. The shoulder is .462″ (just a couple thousandths bigger than a standard case) and the diameter at the web is .470″. 6BR-DX water capacity is about 39.5 grains. Thats about 1.5-2.0 grains more than a standard 6BR case, depending on your chamber. The first time we saw a close-up picture of the 6BR-DX we thought “Wow, that looks just about perfect” for benchrest’s “middle game”, i.e. from 300 to 600 yards. The extra case capacity gets you up into into a nice velocity node that delivers both extreme accuracy and wind-cheating ballistics. Yet, the 0.283″ neck is not shortened much at all so fire-forming is simple and you have lots of flexibility with seating depths and bullet types. The 6BR-DX is a cool new cartridge with lots of potential. This wildcat was developed by gunsmith Doug Paschall, (336) 731-4618, and his client David Stripling used it to set a new IBS Light Gun 600-yard record, of 1.073″ for 5 shots. With the extra boiler room provided by the BRDX, David Stripling can stuff 34+ grains of RL15 into the 6BR-DX, even though the neck, at 0.283″, is just .039″ shorter than a standard BR. With the added capacity, David can launch Berger 88s at nearly 3300 fps, or Berger 95s at 3200 fps. 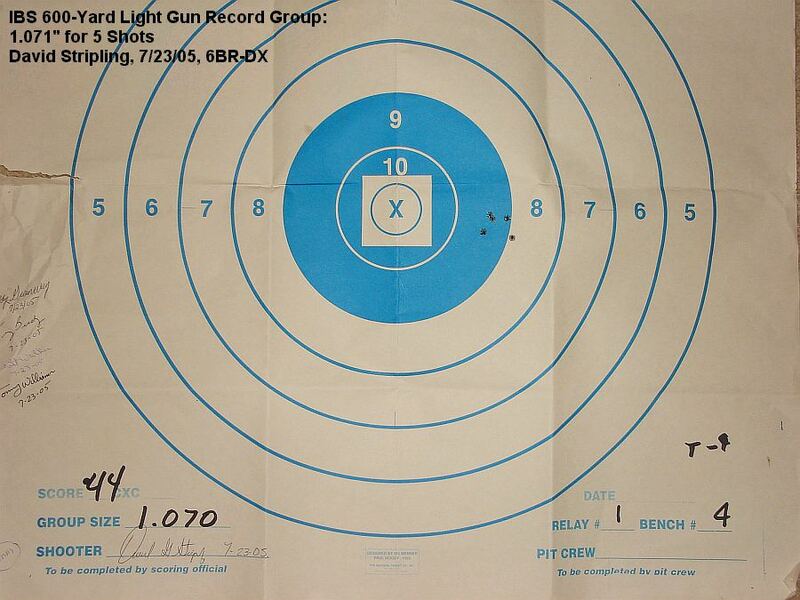 Click HERE to see David’s record target. David reports that Reloader 15 has worked great with the 6BR DX, but we also think Varget, N150, and H4895 would be good choices. David tells us: “I tried a variety of powders in the 6BR-DX including Varget and IMR 4895 borrowing some suggested loads for both the Dasher and BRX. Among the popular powders, Alliant Reloader 15 seemed to work the best in my rifle–providing an impressive combination of velocity and accuracy. 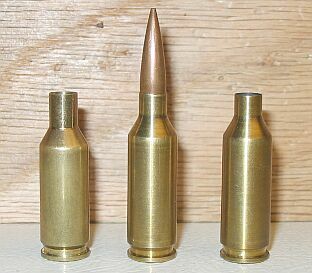 With the RL15, I tried the Berger 80gr match, 88gr Low-Drag match, and the Berger 95 VLD bullets. While the 95s performed well, in my 10-twist barrel, it really liked the 88s. The rifle shoots the best with a near-max load of RL15 pushing the 88-grainers at around 3300 fps. (Editor’s Note: Berger claims a .395 BC for the 88s. If you run the ballistics for the 88s at 3300 fps, you’ll see they compare favorably with 107gr SMKs going 2885 fps. The 107s drift less in a cross-wind, but the 88s shoot flatter, and have a shorter time of flight. Bill Shehane’s 6 BRBS mimics the 6 Dasher, but with a shoulder blown slight further forward and a shorter neck. You end up with just enough neck to seat the VLD bullets above the neck-shoulder junction, but this requires pushing out the throat. Bill figures he gets another 150fps velocity from his wildcat compared to the standard case, with no loss of accuracy. Manson has designed a good reamer for the 6 BRBS. Note: Bill has a clever way to form 6 BRBS cases–he just neck turns half the neck on the standard case. This creates a step that serves as a false shoulder during fireforming. Specs: 40° shoulder, blown forward .120″. Requires Custom Dies. To create an improved 6 BR case, you must fire-form the factory case in an improved chamber. The simplest method is to load the bullet long so the case headspaces on the ogive. The bullet must be seated hard against the lands, with plenty of neck tension. If you don’t get the bullets hard into the lands, the case can bounce forward and you can have misfires. Copyright 20180, 6mmBR.com | AccurateShooter.com, All Rights Reserved. No reproduction without advanced permission in writing.